You may have noticed that discipline is a fairly controversial topic in our day. If you watch a news digest program regularly, you’ll eventu­ally see a story that somehow involves spanking — either about some­one who was abused as a child or someone who is in trouble for abusing their children. The subject is almost always treated with suspicion or even horror, as though anyone who spanks a child is unenlightened and barbaric. It is rarely presented as rational and frequently portrayed in its extremes. And yet the Bible, which quite a few of us still believe is true, says things like “Do not spare the rod.” How are we to sort out the controversy and be obedient to God? Actions and words — it all goes back to those two Hebrew words, yasar and yakach.1 The concept of yasar is chastisement, and it almost always implies something physical. Proverbs 13:24 is clear: “He who spares the rodhates his son, but he who loves him is care­ful to discipline him.” It doesn’t say the one who spares the rod has the wrong opinion about discipline, it says he hates his son. Prov­erbs 22:15 is also clear: “Folly is bound up in the heart of a child, but the rod of discipline will drive it far from him.” A lot of people may not like those verses, but the Bible doesn’t really give us the option of picking our favorites and ignoring the ones we don’t like. These are part of the inspired Word of God, and we have to approach them that way. Though spanking is controversial, I would suggest that there are, in fact, times when it’s appropriate to spank your kids. I under­stand that for some parents, that’s hard; discipline is not for the faint of heart. You don’t need to spank very often, especially if you do it properly and early in their lives. At certain ages and in certain circumstances, spanking is the most effective — and compassionate — approach you can take. In one way or another, every child will fight this battle with his parent. The earlier you win that battle, the better, both for your sanity and your child’s. You can win it when your kids are toddlers, or you can wait and try to win it when they’re teenagers. Victory comes a lot easier when a child is two, and it’s more quickly accom­plished at that age when you use spanking, appropriately and lovingly applied, to enforce it. In contrast, when a child is sent to her room for a time-out, the measure of discipline is more protracted. The message usually isn’t as clear, the resolution is often more uncertain, and the opportu­nity to cleanse the conscience isn’t immediate. There’s less sense of closure. Sometimes it may be a good first consequence when verbal instructions are ignored — I don’t encourage spanking as a necessary first resort in every situation, since a loss of privileges or a time-out can often get your point across — but I don’t believe parents should be afraid of applying physical punishment in a godly way. The idea ingrained in some people that time-outs are always better than spankings is a false assumption. I want to be very clear that discipline never involves slapping or hitting a child. Anyone who has a problem with this needs to get help immediately. If you come from an abusive background, the last thing you want to do is continue the cycle with your children. If that is your situation, let me strongly encourage you to swallow your pride, override your fear, and do whatever it takes to protect your kids from physical abuse. Also, remember it’s never appropri­ate to spank babies or toddlers younger than fifteen to eighteen months of age. 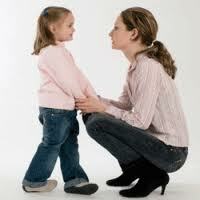 Even shaking a very young child can lead to brain damage or death. Spanking — not slapping or hitting — should always be done by a parent who is in control of his or her emotions. In our home, we used a wooden spoon to spank. My kids dreaded seeing the wooden spoon coming, but they never had to dread the hand of Mom or Dad. Our hands were used exclusively for loving touches, caresses, and hugs; an inanimate spoon was the object of discipline. That may seem like hairsplitting to some, but I believe that in the psyche of the child, there’s a tremendous difference. Scripture makes a strong case for the use of appropriate spanking, and it also identifies an object (the rod) as the tool. Some may believe that the rod implies discipline of any kind. All I know is that using an object fits with biblical instruction, and I’m much more comfort­able reserving my hands for loving touches.